Published on 06. 02. 2012 in comics and cartooning, commentary and criticism, culture, current affairs, hype & linkage and pictorial arts. 2 Comments Tags: Andrei Molotiu, Facebook, Frank Miller, Leonardo da Vinci, Lori Andrews, Martin Kemp, National Gallery London, Prado. Running late as usual, it’s a new week, but what? This weekend the great Leonardo show at the National Gallery in London closed and I regret not having had time to post something more detailed than my Weekendavisen review from back in November while it was still open, but that’s how it goes. Suffice it to say that it was a fantastic opportunity to learn about Leonardo and his workshop, as well as the bizarrely skewed presentation the artist’s mega stardom tends to result in. 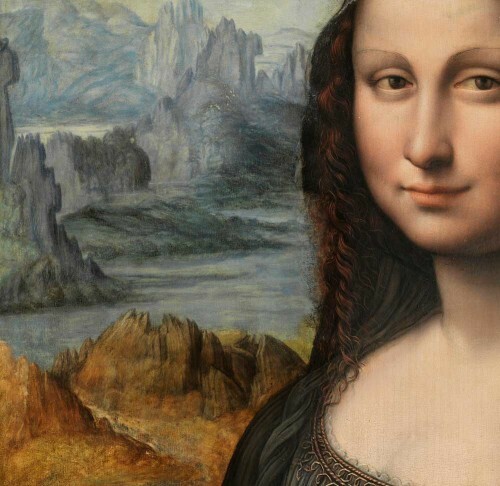 The curators’ position seemed to be that there was a strong separation between Leonardo himself and his assistants, and as noted in my review that he executed the London Virgin of the Rocks himself, while comparison with its Paris counterpart quite clearly suggested otherwise. The same goes for the recently resurfaced Salvator Mundi. If the show’s attributions were to be believed, Leonardo must have painted in about five different styles in his later Milanese years, with results of quite remarkably varying quality, much of it lesser than his earlier works such as the Cecilia Gallerani (again, see my review). What the show did, however, was to exhibit a lot of works by his assistants and associates — Giovanni Boltraffio, Francesco Napoletano, Marco d’Oggiono, and others — and thus to offer the attentive viewer the opportunity to make up his or her own mind as to whom did what and in what constellations. I’m sure insights gleaned from this rare gathering of masterworks will reverberate strongly in the literature for years to come, even if strong interests will continue to work against the deattribution — or assignment in part to the workshop — of revered works. Preeminent Leonardo scholar Martin Kemp suggests as much in his pointed critique of the exhibition. Although the piece seems more than a little grouchy and continues to champion the pretty but bizarre “Bella principessa” drawing, the autograph nature of which — though he claims to have unearthed incontrovertible evidence — still seems hard fully to accept, it makes a strong point on how much extraneous context matters in the contemporary evaluation of Leonardo. Also interesting is the discovery at the Prado of what after cleaning has turned out apparently to be a contemporary copy of the Mona Lisa, which in its clarity reveals details that the dirty and much darkened original hide from us today. This announcement comes only a couple months after the publication in the Burlington Magazine of what has turned out to be a major painting, previously thought lost, by Pieter Bruegel the Elder in the same museum. “Facebook is using you.” Op-ed written by Lori Andrews for the New York Times on the occasion of Facebook going public. Describes with chilling concision the possible implications for individual privacy of social media and their aggregation of personal data. Andrei Molotiu on Frank Miller’s Holy Terror! Molotiu perceptively locates elements of interest in this highly mannered, mean-spirited comics screed by one of the medium’s ailing masters. I don’t really agree with Molotiu — almost everything he describes, Miller has done better and more compellingly before, but it remains a perceptive piece.